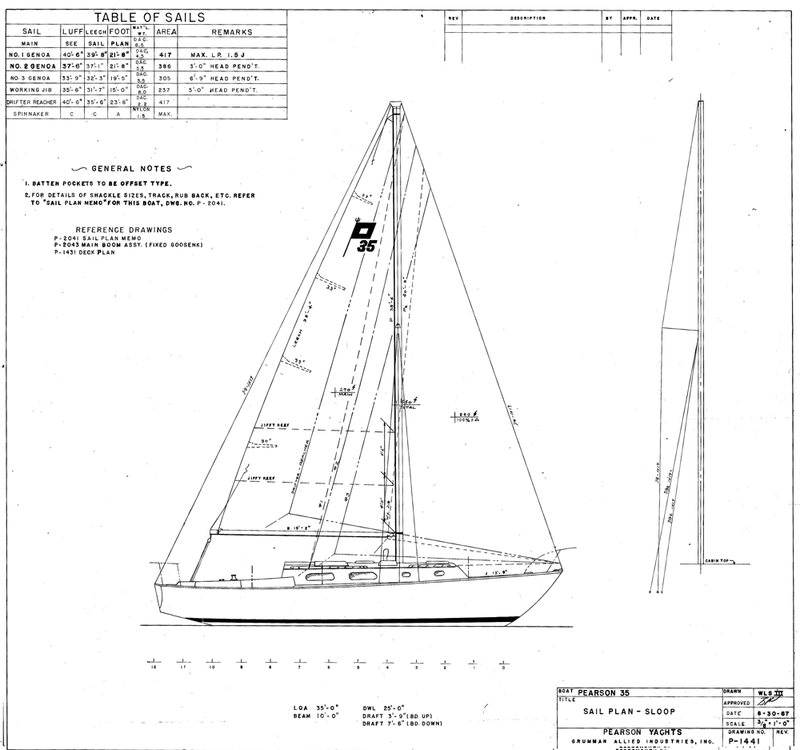 When Bill Shaw first conceived this yacht, his intention was to build something special. Something that would combine superb handling, luxury accomodations and an underwater configuration that offered safe and comfortable cruising in both shoal and deep waters. Luxurious and roomy describes the main cabin. Redesigned to offer additional space, the 35 offers upper and lower berths to starboard, settee/berth with upholstered black-rest to port, and a foldaway drop leaf table which seats six or folds neatly against the forward bulkhead when not in use. And overhead there’s a ventilation hatch for plenty of light and air. Stowage is provided in lockers and drawers under the berths and in bookshelves and lockers outboard to port. The forward cabin has a bureau and shelf stowage. Four drawer lockers are under the roomy, double berth. A sliding door gives complete privacy. To port, in the passageway aft, is the toilet room with stowage outboard and under the vanity. Opposite is a hanging locker, another bureau, and shelf stowage. At the bottom of the companionway ladder is a huge U-shaped aft galley. To port is a gimbaled stove with oven, large sink, trap stowage under the expansive counter. Shelves and food lockers are located above, and there’s drawer stowage under. On the starboard side of the galley is a large counter area for navigation. Underneath is a roomy, top-loading icebox. Above and below are additional areas for stowage of navigation equipment, food and utensils. The oilskin locker is something you’ll find very useful. 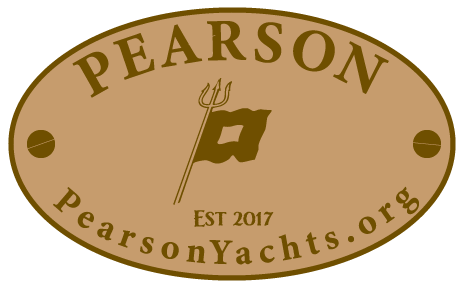 The more you appreciate the amount of time you spend in the cockpit, sailing or sitting at the mooring, the more you’ll appreciate the Pearson 35’s huge 9’5" cockpit and well-placed pedestal steering. 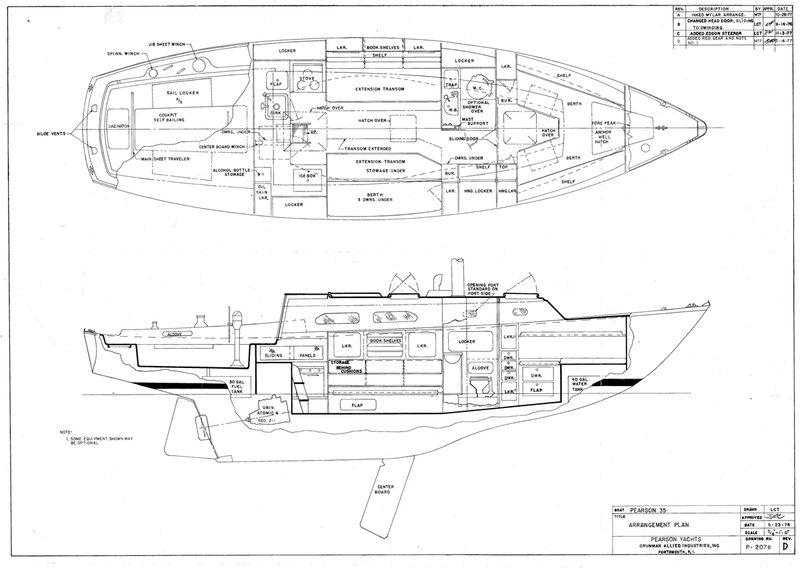 Her deck plan adds greatly to the pure joy of cruising. Walkways are wide. The foredeck, with enclosed anchor well, is a large sunbathing platform. Winch island caps and toerails are rich teak. In the cockpit is a wealth of stowage space in the lockers port and starboard and in the lazarette aft. Pearson’s wide choice of decorator fabrics for berths, color coordinated curtains and carpeting will delight the fussiest first mate. 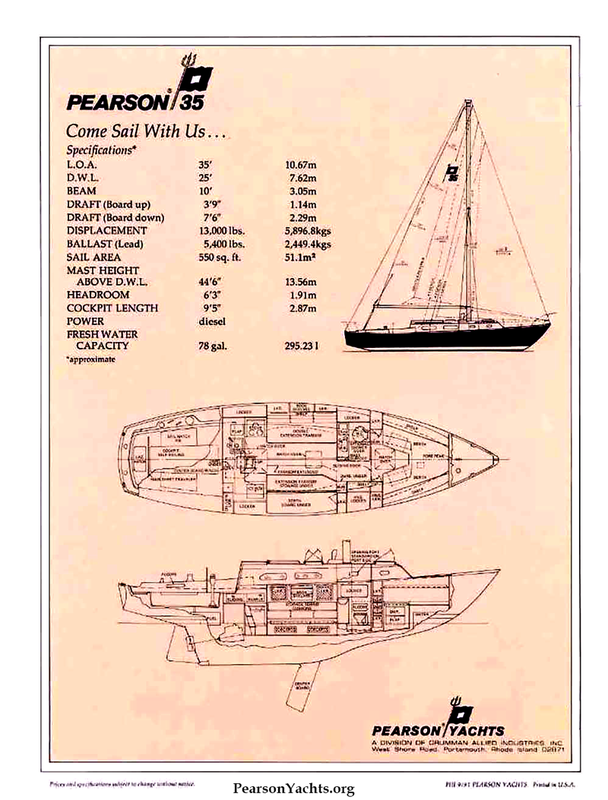 When you think about performance in a yacht, consider this: The Pearson 35 has enjoyed the longest production fun of our entire line of auxiliaries. She’s earned the respect of all those who have a special fondness for a responsive balanced cruising yacht with exceptionally attractive lines and luxurious appointments. She might be called "the boat that made us what we are today. "…We may build her forever… Come Sail with Us. Forward Cabin: As most owners elect to use this cabin for their stateroom, it features, in addition to the classic V-berth arrangement, a hanging locker to starboard and a locker and bureau to port, providing ample stowage space without encroaching upon areas allocated to guests. A large forward hatch provides light and ventilation as well as ease of access from the deck. A sliding door provides complete privacy for the spacious owners’ quarters. Toilet Room: Completely enclosed, with a sliding door, permitting passage fore and aft at any time. A molded fiberglass vanity unit, incorporating wash basin highlights the toilet room, soap dish, laundry trap, and expansive storage under. The sole is molded fiberglass, facilitating cleanliness and sump drainage for the optional shower. The inboard bulkhead is studded with individual shelves for personalized storage of toilet articles and the outboard side is given over to the large storage locker with sliding doors. Opposite the toilet room on the starboard side is a large enclosed hanging locker with extensive shelf storage above. Main Cabin: Big headroom of 6’4" and beam of 10’ give this cabin plenty of room to live in. 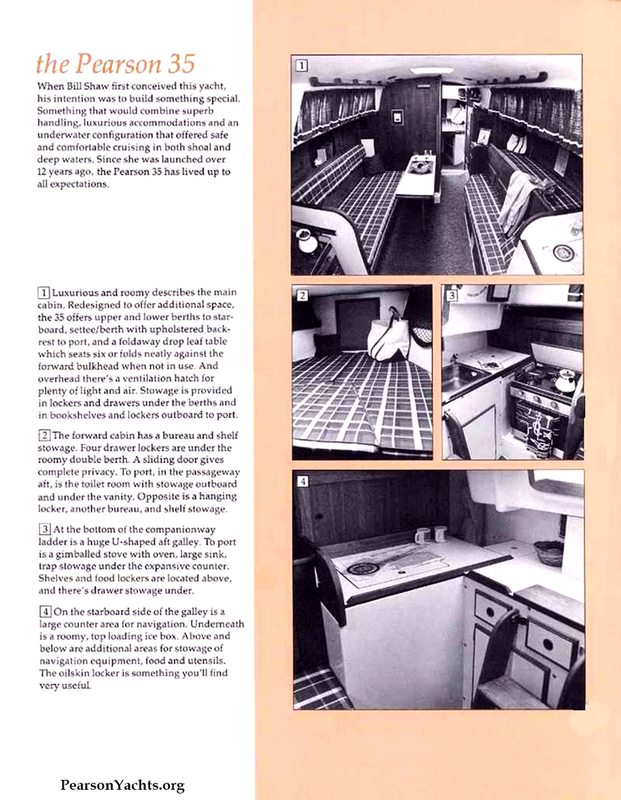 An L-shaped dinette opens up the floor space but, with an extension on the aft end, readily converts to a U-shaped dinette of a double berth when the table is lowered. A table leaf extends the size of the pedestal mounted table, accommodating seating on all four sides. An upper berth is built into the starboard side, with stowage beneath, and extension transom berth below. A translucent ventilation hatch overhead admits light and air into this commodious and most practical main cabin area. Galley: Designed to please ship’s cook, the galley is located aft in the most convenient and comfortable part of the boat; features ultra modern materials and ingenuity. Stove and sink are to port. A 9 cubic foot icebox, with molded fiberglass liner, is adjacent to the oilskin locker on the starboard side. More then 12 cubic feet of enclosed storage space highlights this generous and expansive galley. There is even a deep, double level trap locker at countertop outboard of the stainless steel sink. Convenient pot storage is outboard of the stove recess and there are numerous drawers throughout; just the ticket to delight a cook who never before has had a place for everything. Cockpit: An inviting 9 ½’ Cockpit extends aft to the transom providing convenient athwartship seating with the lazarette underneath. Large sail lockers are located both port and starboard. 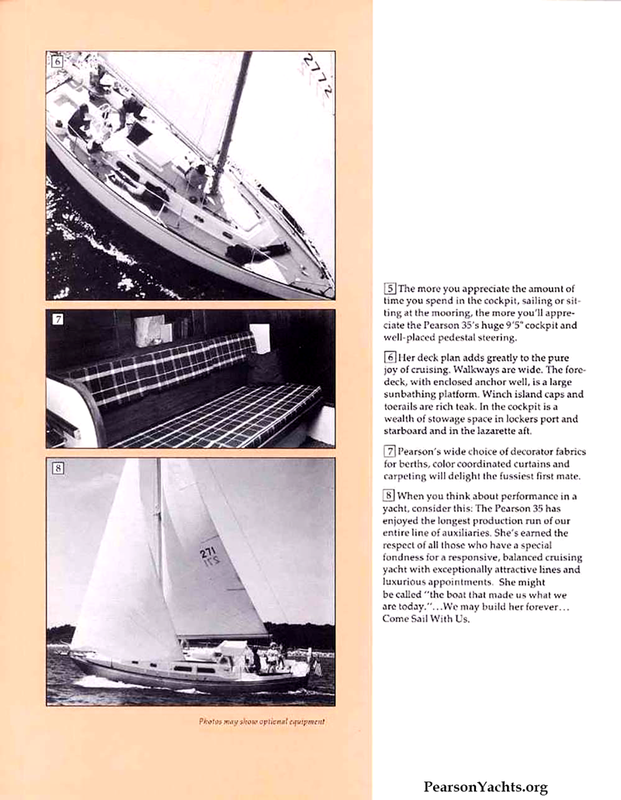 The teak capped fiberglass coamings are wide and high, comfortable to sit on or against, and incorporate wide winch base areas with handle stowage in cutouts under. 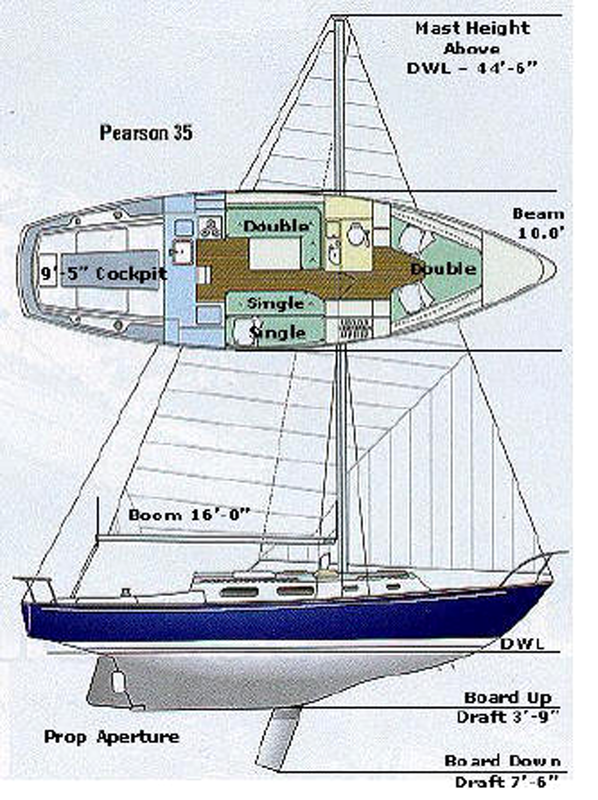 Deck Arrangement: Side decks on the boat are extra wide and uncluttered for safety and ease of sail handling. Forward and companionway hatches are large for easy access and good ventilation. In addition, a hatch has been installed aft of the mast to provide extra light and ventilation in the main cabin. Integral fiberglass moldings on the cabin top permit installation of the optional canvas dodger. Hull form: The popular keel-centerboard combination makes possible adjustments to improve balance when sailing conditions change; permits shoal draft cruising. 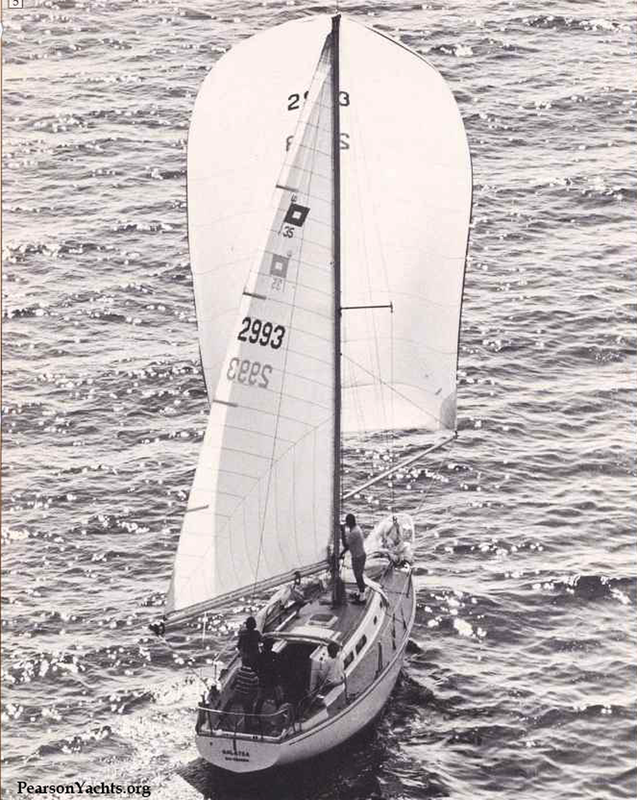 Rig: the conventional masthead rig is the simplest and strongest method of staying a mast in use today. Also, and excellent ratio of sail area to wetted surface insures good all-around performance. Comfort-minded racer: Beautiful new look in a sleek keel-center-board hull built for competitive racing and adventurous auxiliary cruising. 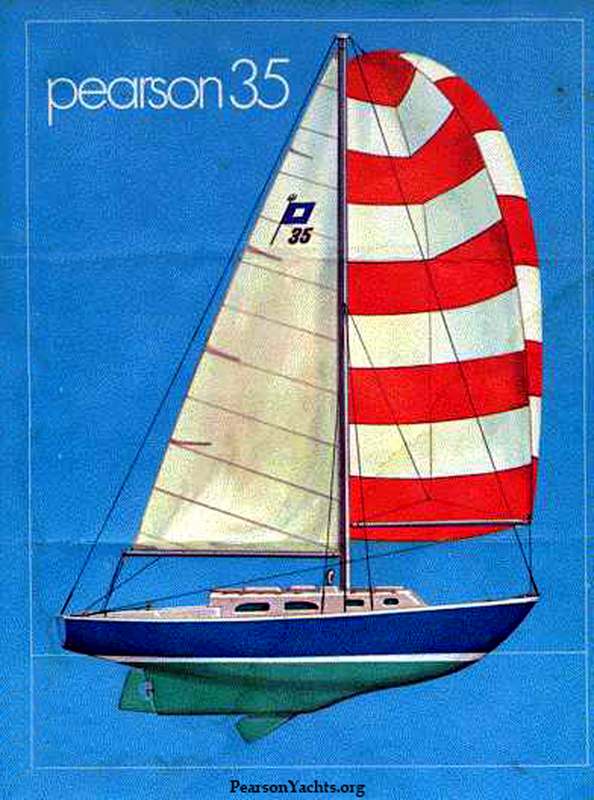 Easy to handle, the Pearson 35 combines stable sailing, regardless of conditions, and fine racing performance potential. A deceptive 10’ beam provides generous accommodations for a boat this size, with wide decks and an extra long 9 ½’ cockpit. Two big cabins sleep 6 comfortably, include a private head, roomy galley and unique dinette arrangement. I’ve often wondered what it takes to become a classic. Is it age, long-term popularity, the vote of experts? Or is it simply continuing acceptance on the part of those to whom the product is intended to appeal? My guess is that a classic represents a mark of excellence and an enduring quality that makes it as appealing as when it was first designed. 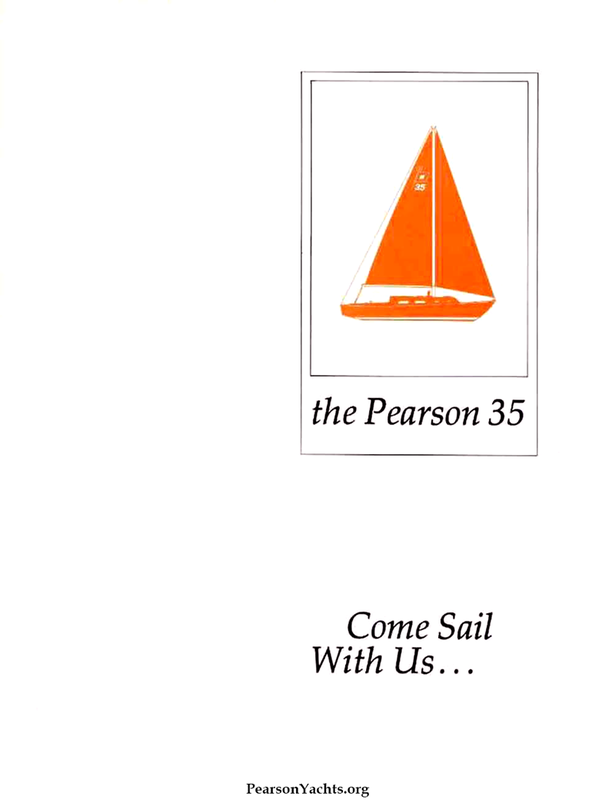 I designed the first Pearson 35 in 1967 and she was launched shortly thereafter. Under TLS of three owners, interestingly enough she looks as beautiful today as the day we broke champagne on her bow. 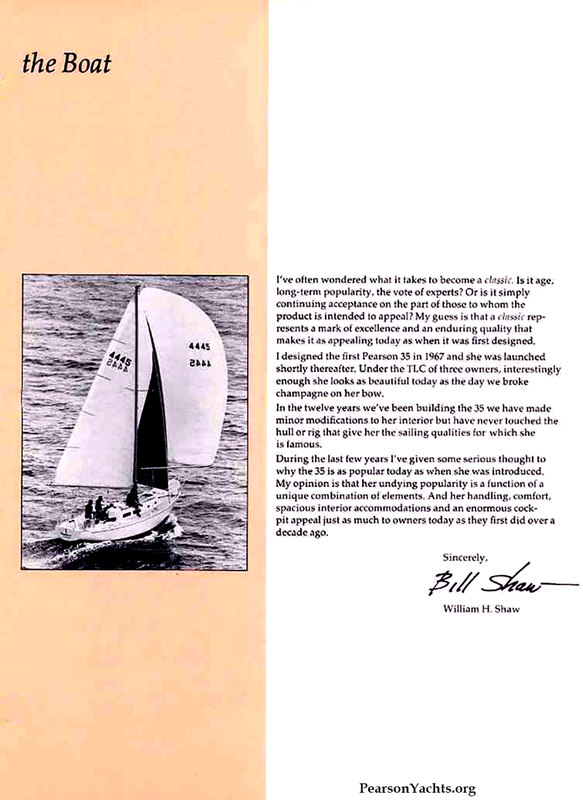 We set out to create a top-quality sailboat that encompassed these basic attributes while still retaining the ability to perform well under sail. In the twelve years we’ve been building the 35 we have made minor modifications to her interior but have never touched the hull or rig that give her the sailing qualities for which she is famous. During the last few years I’ve given some serious thought into why the 35 is as popular today as when she was first introduced. My opinion is that her undying popularity is a function of a unique combination of elements. And her handling, comfort, spacious interior accommodations and as enormous cockpit appeal just as much to owners today as they first did over a decade ago.